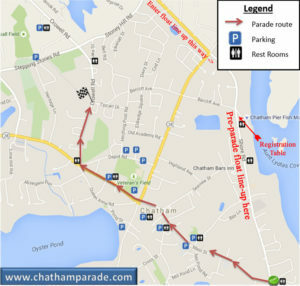 If you prefer a paper form, click here: Parade Registration Form 2019 Return your signed application and any questions by June 1, 2019 by emailing it to chathamparade@gmail.com, or bringing it to the Chatham Town Hall. Please email any questions to chathamparade@gmail.com. All Entries will be reviewed by the Independence Day Parade Committee, and if it does not meet all requirements, participation will be denied. Everything must be filled out completely for the application to be accepted. Rules for Participation – These rules are for the safety of everyone. 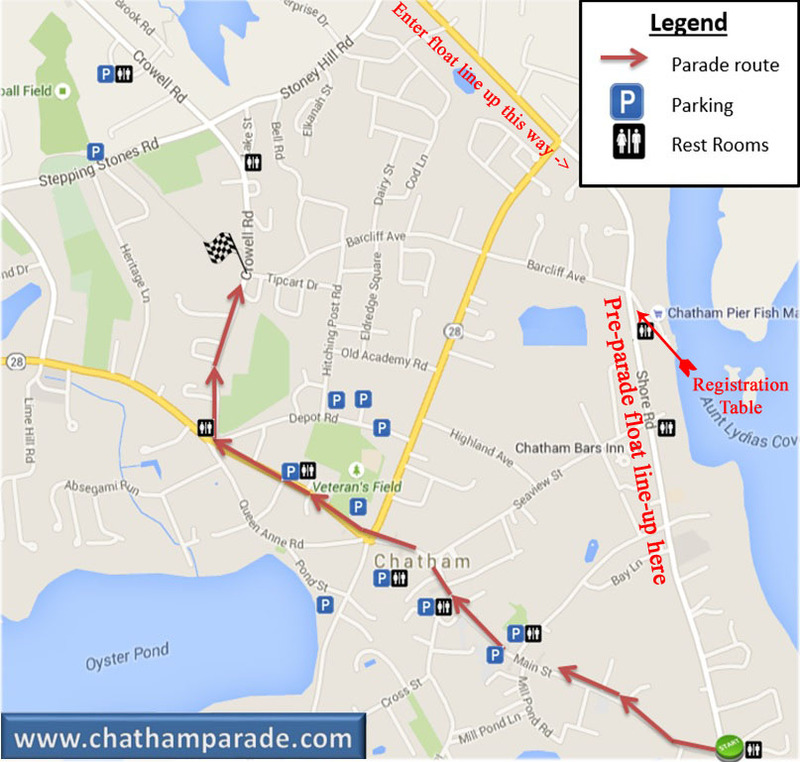 Not following these rules could jeopardize your participation in the parade and future parades, with the decision of the Chatham Independence Day Parade Committee being final. No float apparatus or act can exceed 14 feet height from street level and width must not exceed 8 feet. All Entries and displays must be free from images reflecting cruelty, denigration or abuse to persons or groups, because of race, creed, gender or economic status. Emergency vehicles must be given right of way at all times. Entrants must abide by all laws of the land. Participants must remain grouped within parade boundaries or as directed by Police or Parade Monitors. If the parade stops, participant groups must remain together. Unauthorized stops along the parade route are not permitted. It is essential to keep pace throughout the parade for the best experience for the spectators and other entrants. Drinking alcoholic beverages is prohibited while in line before start of parade and during parade. Throwing anything to the crowd, including candy is strictly prohibited. This creates a potential dangerous situation with implication of safety and injury. Entrants’ position number in the parade will be assigned and listed on the Independence Day Parade Committee website on June 24th and appear in the June 27th issue of the Cape Cod Chronicle. Date of registration will not factor into parade position. Position number must be displayed on the LEFT side of the Entry. Entrants who are not able to check in during the above times must check in prior to positioning on Shore Road with a Parade Monitor stationed at the Chatham Town Fish Pier on the morning of July 4th. The parade begins at 9:30am at the intersection of Shore Road and Main Street, and finishes at the intersection of Crowell Road and Tip Cart Road. Please adhere to police instructions for exiting the parade area. For those wishing to park at the Monomoy Regional Middle School, a shuttle bus will take you to Shore Road. This shuttle will run starting at 6:30AM. The shuttle will run from the end of the parade back to the Monomoy Regional Middle School. To qualify for awards, the Entry must be consistent with the theme. All awards are determined solely at the discretion of the Judges. Entries are viewed by Judges along the parade route. The Judges’ reviewing stand is located on the lawn of the First United Methodist Church at the intersection of Main Street and Cross Street. Please do not stop here and delay the parade. Your Entry may win more than one award. Overall Best Entry – 1st Place which will be recognized by an engraved brass plaque on the Chatham Parade Trophy displayed at Town Hall. awards ceremony during a Board of Selectmen meeting later in July.